Note: Many bottled inks on sale in high street stores can have a corrosive affect on a fine pen. 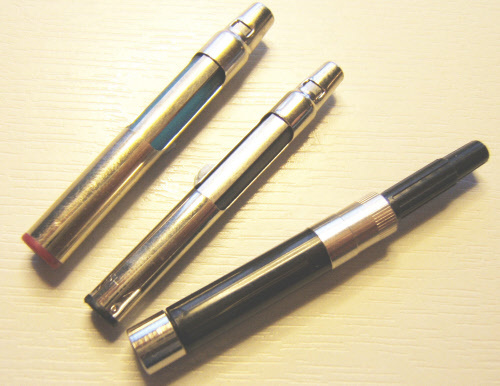 They contain harmful solvents which block the ink flow govenor and generally shorten the life of your pen. MrPen stocks the finest consumables from the original manufacturers your new pen deserves no other. Huge range of nine colours and Mr Pen stocks them all. Priced for pack of five. Note: Sheaffer have recently changed their colour titles. Slim = Fits DeltaGrip, White Dot Fashion. Sheaffer no longer supply leads. Order Faber-Castell 0.7mm from the Faber section below. Suitable for Sheaffer and all 0.7mm lead pencils. Resistant to breakage Super-Polymer leads, made by Faber Castell the world's premier maker of fine pencils and graphite leads.